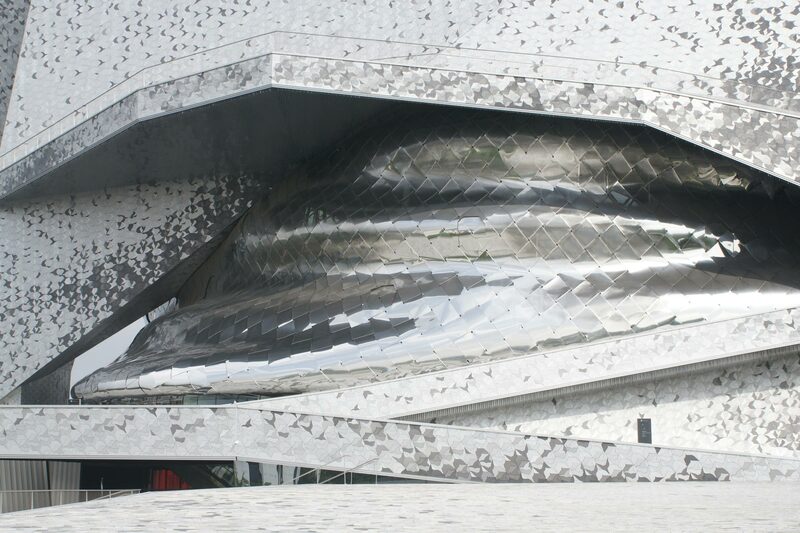 “The Philharmonie is like a flagship event forming a harmonious relationship with the Parc de La Villette, the Cité de la Musique and the city’s ring road, the boulevard périphérique. The building and its lobbies offer terrestrial pleasure, a place where people can arrange to meet, spend hours browsing through the boutiques, enjoying a drink or a meal in bistros overlooking the garden, or reading in a lounge. The auditorium evokes the immaterial nature of music and light, the audience being as though suspended on long balconies offering wider, deeper seating for an outstanding level of comfort. This suspension creates the impression of being surrounded by and immersed in the music and light. The “volumetric cyclorama” envelope can be lit selectively to accompany the pieces being performed. From time to time, the windows overlooking the park and the suburbs can be opened. The energy concept takes into account the hight requirements of acoustic and thermal comfort. It is based on displacement ventilation, radiant surfaces and renewable energy supply. The building is heated using the environmentally friendly district heating and with a heat pump based on geothermal heat.